Vesuvius Pizza is a restaurant located on Springfield's Fast-Food Boulevard. It serves pizza and its roof is shaped like a volcano. 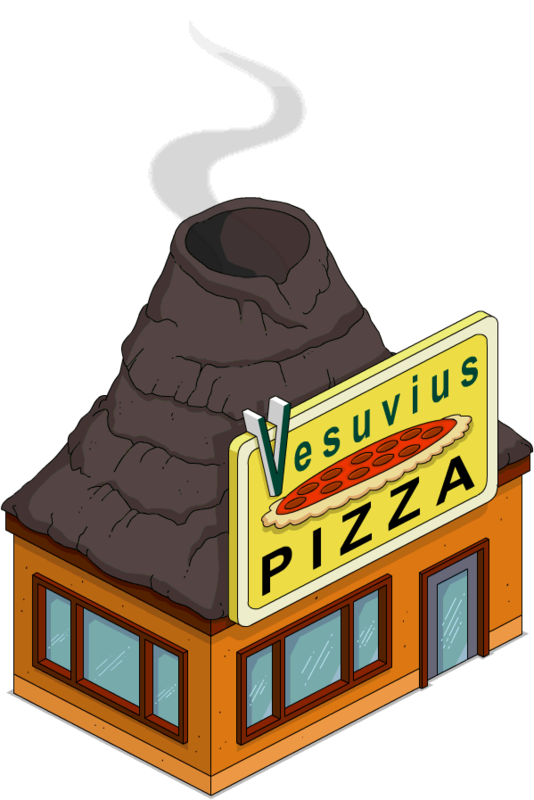 Vesuvius Pizza was destroyed (along with the rest of the restaurants on Fast-Food Boulevard) in a bizarre explosion caused by Homer Simpson. 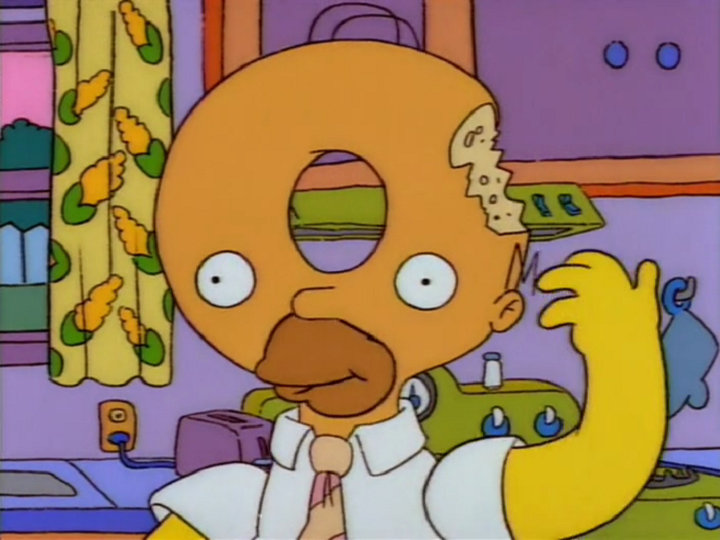 His careless disposal of a leaky car battery caused a leak in an underground gas main, followed by a chain-reaction explosion when Homer tossed a lit match into the same wastebasket as the battery. 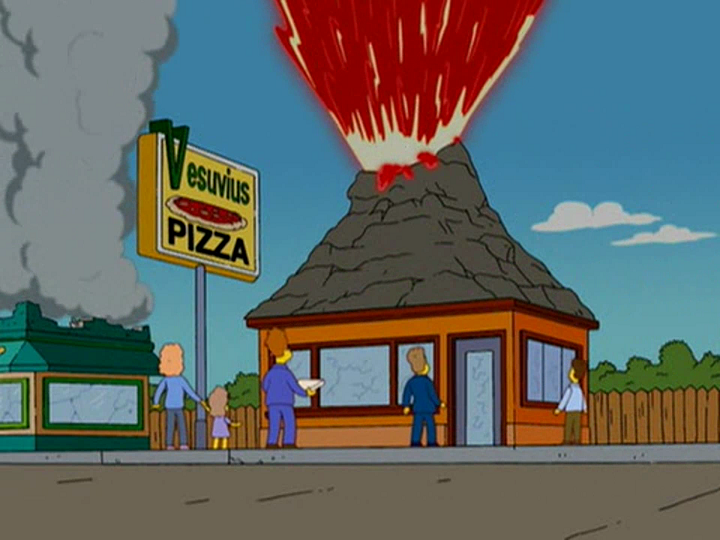 When the chain of explosions reached Vesuvius Pizza, marinara sauce shot out of the restaurant's volcano-shaped roof, creating a spectacle which resembled an erupting volcano and attracted several onlookers. Several pizza dough patties also flew out of the explosion and hit people in the face. Hans Moleman, who was among the people watching the explosion, then held his arms out wide and looked up in the sky, expecting to also receive pizza dough in the face. Instead, he was crushed by a large chunk of debris which fell on him. Vesuvius Pizza is named for Mount Vesuvius, a real-life volcano located in Italy. The restaurant's roof resembles depictions of Mount Vesuvius prior to its eruption of 79 AD. Captain Corndog's Schnitzel Palace • Chili Blasters • Dead Lobster • General Chang's Taco Italiano • Kentucky Fried Panda • Krusty Burger • Lard Lad Donuts • Luigi's Pizza • Vesuvius Pizza • We Have Restrooms! Modified on February 26, 2017, at 13:46.